Growing up, I was never much one for sweets or candy, my junk food of choice was always chips. Chips, Hot Pockets and soda. Every day after grade school I would come home, heat up a pizza or ham & cheese (my personal favorite) Hot Pocket, grab a can of Dr. Pepper and watch Thundercats or whatever else was on. I’ve since switched to diet soda (those suckers add up) and usually go with pretzels or baked chips, but every now and then I go for something good and bad for me like these (I’m guessing) new Doritos. 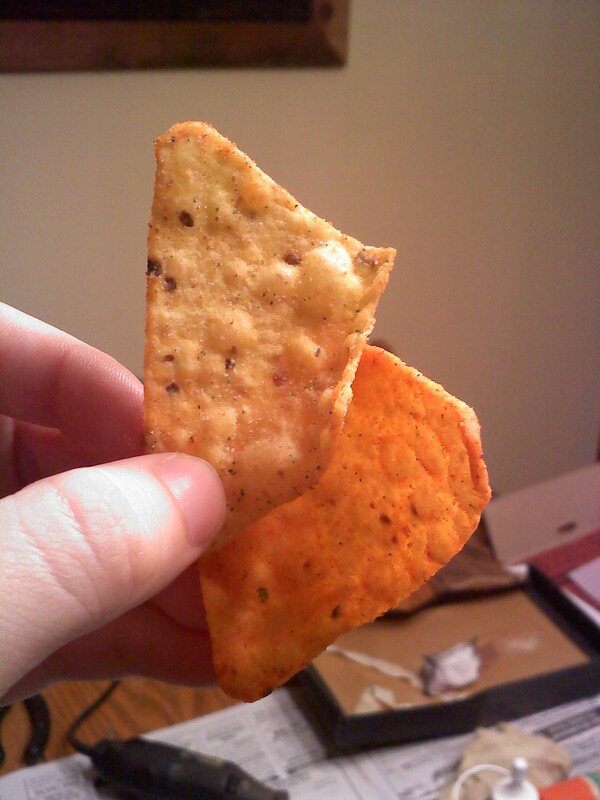 I’m a fan of Doritos branching out as long as I can always get regular or Cool Ranch whenever I want. So far, I’ve enjoyed these Collisions, which mix two kinds of chips based on two foods that go together, in this case it’s cheesy enchilada and sour cream. The Sour Cream chips (the ones on top in the above picture) tasted mostly like Cool Ranch, but had a sour cream flavor to them. Now, whether I’d be able to figure out the flavor without knowing what it was, I’m not sure. A lot of this flavor chemistry stuff boils down to being primed to figure out what the flavor is. The Enchilada chips actually reminded me of pizza chips with a bit of a spicy kick to them. I think the chips I’m thinking of were called Pizzarias (you can check them out here at the ridiculously detailed snack website Taquitos.net. Interesting side note, I went to marriage camp with Keith, one of the dudes who runs that site, small world, huh?). 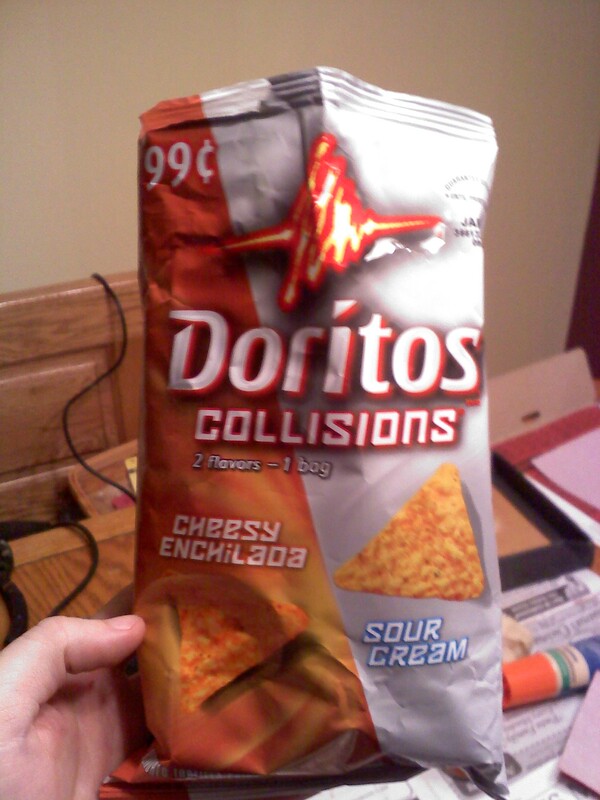 Anyway, overall, I liked these chips, but don’t think I’d get them again on my own. I’m not a big fan of spicy chips and even though these weren’t overly spicy, I’d still rather grab a bag of Cool Ranch and just go crazy. You know, Broadway style.